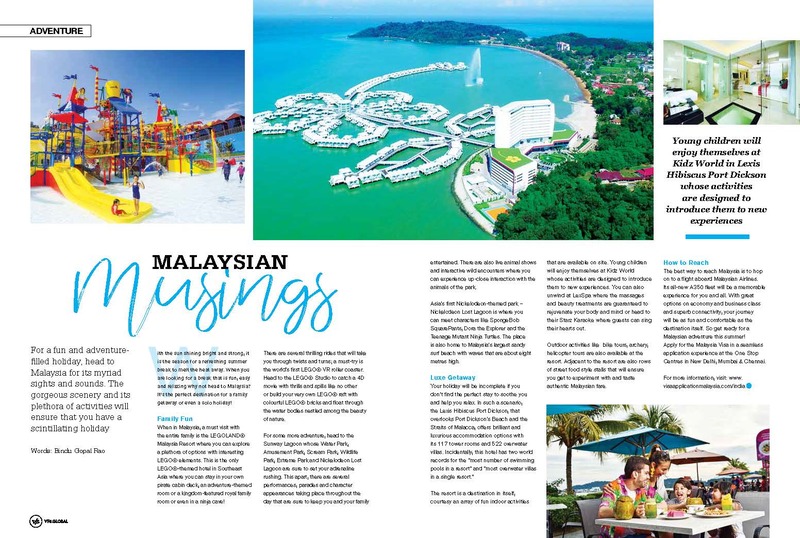 For a fun and adventure filled holiday, head to Malaysia for its myriad sights and sounds that will ensure you have a scintillating holiday. With the sun shining bright and strong, it is the season for a refreshing summer break to melt the heat away. And when you are looking for a break that is fun, easy and relaxing why not head to Malaysia the perfect destination for a family getaway. When in Malaysia, a must visit with the entire family is the LEGOLAND® Malaysia Resort where you can explore a plethora of options with interesting LEGO® elements. This is the only LEGO® themed hotel in South-East Asia where you can stay in your own pirate cabin deck, adventure theme room, kingdom featured royal family room or even in a ninja cave. There are several thrilling rides that will take you through twists and turns and a must try is the world’s first LEGO® virtual reality roller coaster. Head to the LEGO® Studio to catch a 4D movie with thrills and spills like no other or build your very own LEGO® raft with colourful LEGO® bricks and float through the water bodies nestled among the beauty of nature. For some more adventure head to Sunway Lagoon whose Water Park, Amusement Park, Scream Park, Wildlife Park, Extreme Park and Nickelodeon Lost Lagoon is sure to set your adrenalin rushing. This apart there are several performances, parades and character appearances through the day that are sure to keep you and your family entertained when you are here. There are also live animal shows and interactive wild encounters where you can come up close with the animals of the park. Asia’s first Nickelodeon themed land, Nickelodeon Lost Lagoon is where you can meet characters like SpongeBob SquarePants, Dora the Explorer and the Teenage Mutant Ninja Turtles. This is also home to Malaysia’s largest sandy surf beach with waves that are about eight meters high. When you are in Malaysia it is a great idea to stay at the Lexis Hibiscus Port Dickson that overlooks Port Dickson’s beach and the Straits of Malacca and offers a luxurious accommodation option with its 117 tower rooms and 522 overwater villas. Incidentally, this hotel has two world records for the “most number of swimming pools in a resort” and “most overwater villas in a single resort.” The resort itself is a destination in itself courtesy an array of fun indoor activities that are available on site. Young children will enjoy themselves at Kidz World whose activities designed to introduce them to new experiences. You can also unwind at LexSpa whose massages and beauty treatments are guaranteed to rejuvenate your body and mind. The Starz Karaoke is where guests can sing their hearts out. Outdoor activities like a bike tour, archery, helicopter tour are also available at the resort. Else take a free shuttle to the Army Museum & Regina Mall. Adjacent to the resort are rows of street food style stalls that ensure you can taste authentic Malaysian fare. And the best way to head to Malaysia is to hop on to a flight aboard Malaysian Airlines whose all-new A350 fleet is a must experience. With great options on economy and business class and superb connectivity your journey is as great as the destination itself. So get ready for a Malaysian adventure this summer.